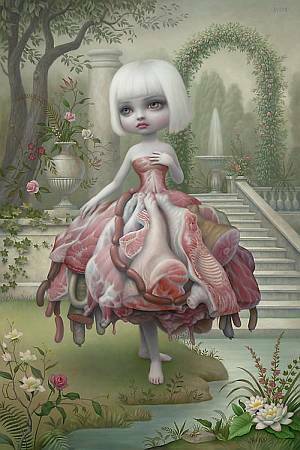 Is Lady Gaga a Mark Ryden Fan? After a week of visiting family in Manitoba, I’m home & back in the swing of things, which (of course) means using the trending topics on Twitter to find out what I missed! I don’t usually watch the VMAs, possibly because I don’t usually watch music videos, but more likely because all of the awards seem to go to a really small pool of musicians, few of whom I can stand to listen. I am, however, a Lady Gaga fan. I wouldn’t say I’m a fan of her music per se, but I love the crazy outfits, I love the music videos with massive production value (I watched Telephone on YouTube) & I love seeing someone doing something interesting with their celebrity. Love her or hater, you can’t deny that she’s more interesting than discussing Lindsay Lohan’s most recent rehab stint. So. Since “meat dress” has been a trending topic on Twitter for several days now, I finally caught up with pop culture & watched the VMAs. My immediate reaction? Lady Gaga is a Mark Ryden fan! Rad!! Meat dress aside, don’t you think the VMAs would be more interesting if they actually played some of the videos? I don’t have cable, so maybe I’m an odd duck for only seeing 2 videos in the past year. However, when I *did* have cable it seemed like bad reality-format shows had replaced the music videos. Meh.